Lately I've been utilizing eBay to clear out some of my old armies to make some space and generate funds for new projects. While I've been going through this process, I've been looking through a lot of pictures of my old armies and fondly remembering each one and its significance to me. In the spirit of that, I thought it would be interesting to go over a brief history of the armies I've collected and painted over the years. First of all, I'll just clarify that the first models I painted are not on here simply because I have no pictures of them. If I did, I would love to share them. I started in miniature wargaming with Warhammer 40,000 during 4th edition when I was in junior high school. I built small (barely playable) Ultramarines force with some... shall we say "interesting" painting techniques. The entire force was painted with gloss enamel model paints. Like many young gamers, I drifted in and out of the hobby as time went on. I tried out other games such as Dungeons and Dragons 3.5 Edition, Axis and Allies Miniatures, Warmachine, Hordes, Battletech, and Blood Bowl in this time as well. It wasn't until I was in high school that I made a real foray into army scale games with a properly sized force. I got into Warhammer Fantasy with a humble High Elf army. I would print Warhammer banners off of Google Images and then paint over them to make them look more authentic. The concept behind the colour scheme for this army was "Space Wolf colours on High Elves". I also chose the dark basing scheme to represent a High Elf expeditionary force attacking Naggaroth. Caradryan was my first ever Finecast figure. Thankfully, you couldn't really see any of the air bubbles once I finished painting it. One of the difficulties of gaming for me during this time was that I lived out in the country, outside of Winnipeg and as such there were very few miniature wargamers. To be more specific, there were none. I order to allow non-gamer friends to play Warhammer with me, I traded away some of my old Hordes models for a beaten up Warriors of Chaos army which I have repainted. They were supposed to be a tribe of Nurgle worshippers, which instead of disease were stricken by near constant famine. As such, they were constantly pushing into other races' territories to gather what meagre resources they could to survive before the Nurgle's famine would follow them to their new location. I experimented with P3 paints for the colour of the armour, which was painted using the Cryx paint set. This army also contained my first attempts at rudimentary freehand for the banners with their checkered pattern. I would highly recommend painters who want to practice basic freehand to try it with Warhammer Fantasy Orcs or Chaos as it doesn't have to look perfect to look good. I also threw in some Space Wolf heads to add some variety and character to the warriors. 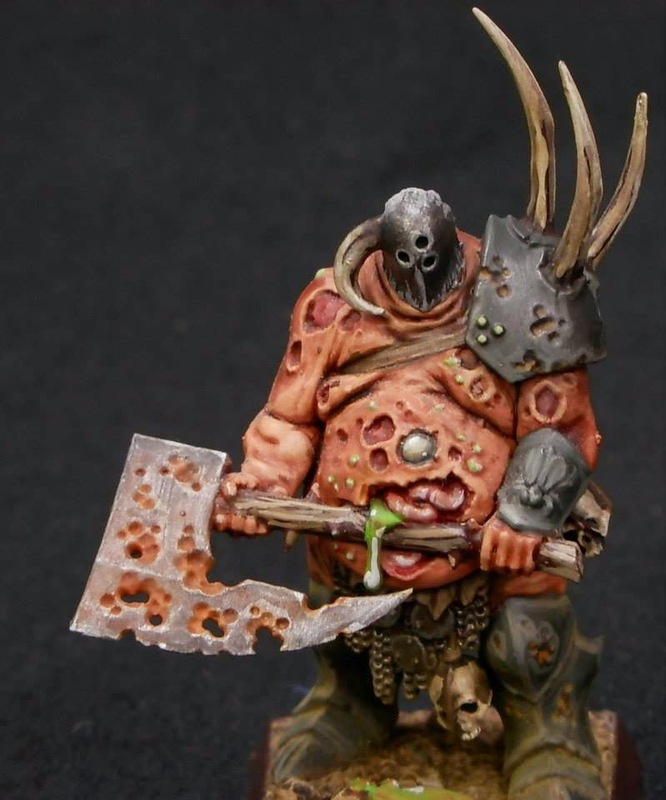 The Nurgle Lord I painted to be the army's general. The next major projects I did unfortunately lack any significant photograph documentation, but coinciding with the release of Dark Vengeance for Warhammer 40,000 I started a Chaos Space Marine army and a Dark Angels force. I built both off of the contents of the starter set. This period saw my first attempts at magnetizing vehicle accessories as well as the further developing of my freehand skills, particularly with the Dark Angels as the new banner that gave them Salvo 2/4 on their bolters was a personal favourite of mine. One of the few pictures I have of the models I painted during this period. This was one of my first models that I tried painting OSL on. My Necrons were probably my favourite army that I've worked on. This army was a real adventure in hobbying as I tried many new techniques such as weathering powders, weathering metallics with a graphite pencil, and the further development of my OSL skills. This was the first army that I added Forge World models too and it without a doubt has gotten the most time on the tabletop of any of my armies. I loved running large twenty-man Necron squads with a Lord carrying a Res Orb supported by a Ghost Ark or two. It was a very fun way to play the game. 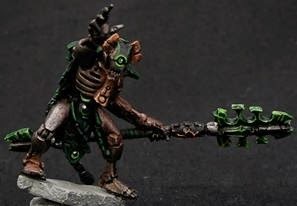 My Necron Cryptek was my first submission into a painting contest, and took gold in the 40k Single Model category in a local competition. I also painted my first Super-Heavy Vehicle for the Necron army. With the Necrons, I really focused on efficiency in painting. I wanted to be able to paint as many figures as quickly as possible while still having the figures look as good as I possibly could make them. I enjoyed painting like this, but I still wanted to go all out on some models and make them as detailed as I knew I could with more time. For this reason, I then started a small Grey Knight Draigo-Wing force. I used Secret Weapon Miniatures resin bases for these models and I took the time to magnetize all of their special weapons. It was a neat army and one that was particularly challenging for me as it was the first army that I used the an airbrush to paint. After the Grey Knights, I moved into an overly expensive passion project, which was building a company worth of Rogue Trader era Ultramarines. I don't really have much to say about this project, but if you're thinking about doing something like this, don't. Seriously. If I could go back and give my self on piece of advice in my hobby career, it would be to resist the urge to undertake this project. To this day, I still can't tolerate the smell of Simple Green anymore. You'll likely be paying Forge World-comparable prices for old beater models. Steer clear and spend that money on some Horus Heresy stuff. Don't say I didn't warn you. I don't remember this project fondly like I do with the Necrons. I painted some Orks up just for a fun painting project after that. This was my first attempt at using glazes, a technique which has been extremely useful for the development of my colour scheme for the Mars Attacks! Martians you see on the blog these days. That pretty much wraps up the brief history. I've skipped over some sections that there were no pictures for, as describing a colour scheme generally doesn't make for ideal reading material. I hope that the progression of my painting has been apparent through these pictures and explanations, and I especially hope that some of the newer painters reading this find some kind of motivation to keep pushing their boundaries. The only way to do it is to put brush to model, so get painting. I hope you've enjoyed this post. If you'd like to see more content from Nothing But Sixes, follow me on Twitter (Nothing But Sixes @nothingbutsixes). If you would like to help others discover this blog, hit the G+1 button to recommend it. Thanks for reading and happy gaming.